Jewelry, Art and Life: Welcome to the 1st Reveal of the 6th Bead Soup Blog Party! Welcome to the 1st Reveal of the 6th Bead Soup Blog Party! Woo-hoo! Welcome to the 1st reveal for the 6th Bead Soup Blog Party! A HUGE thank-you should first be made to the amazing Lori Anderson for all the work that goes into these. Lori has done the beading community around the world such a fabulous service for putting these events together! I got paired up with the amazing Birgitta Lejonklou of Sweden for this Bead Soup Blog Party, and I was absolutely amazed at what she sent me. Two pieces of sari silk, a chain, and five of her amazing handmade porcelain cabochons and pendants! Not to mention the cool copper clasp and the assortment of glass, gemstone and wood beads. The whole package was just breathtaking! My initial thought was to use the Buddha connector with a bead and wire chain, but no matter how hard I tried, I couldn't make the design work. Realizing that I was getting reeeeeeeeally close to the deadline, I had to come up with something fast. So, I had to resort to my good old quick'n'dirty beaded cabochon skills. The first piece that drew me was this gorgeous flower cabochon. I started stitching on it for a while, but then ran out of steam. I had a much grander piece in mind, and didn't want to do it a disservice by just doing something fast. But fast was what I had to do, because I was running out of time! I put some of my newly-acquired wire wrapping skills to good use and attached the copper clasp to the length of brown sari silk. Then I stitched up a bezel and added some crazy fun embellishment to the cabochon! I've been having some fun lately playing with different edgings and trims for my cabochons. I love the look of lace surrounding the cabochon, and I think I may have to turn that edging into a full-fledged beaded necklace! So, while you're here, check out all the other amazing goodies that are being revealed today in the Blog Party! Whew! That's a lotta blogs! And please, please head over to Birgitta's blog, Create with Spirit, and check out what SHE made with the soup I sent her! She's really a fantastically talented jewelry designer in addition to being a gifted ceramic artist. Lots of pretty stuff to look at! So now, if you'll all excuse me, I'm off to the farmer's market and to cook dinner for eight! Have fun! Wow - you may have run low on time but the results were just stunning! WOW!! Beautiful bezel and gorgeous sari silk set off Birgitta's wonderful cabochon. Love your wire work too. Look forward to seeing what else you make. 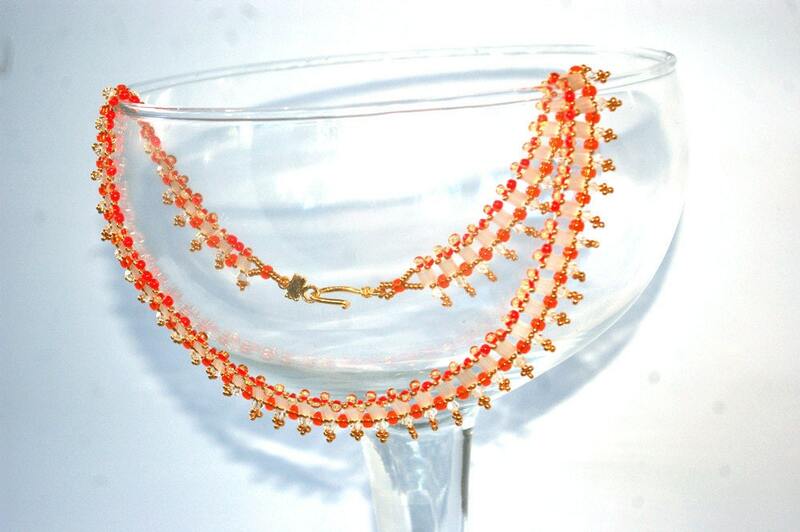 I love the rust colored beads and pendant with the sari silk, it's very pretty! Love the colors. What a great soup to work with. You did an amazing job! Wow! What a cool soup to work with! I love the pendant you created so far---beautiful colors and textures! Enjoy the rest of our soup! I love your work. Your pieces are just gorgeous. So I have to subscribe to your blog now..... because I really really want to see what grand plans you have for that flower medallion :D Gorgeous work! I love what you started with the floral cab and I really love what you did with the brown cab it is gorgeous. Have fun creating the rest of the floral cab I can not wait to see what you did with it. Wait. Quick and dirty and beaded cabachon are words that i doubt I've ever seen together. Looking forward to seeing what you do with your first start. This necklace sure is a dandy! And thank you so much for your participation! Gorgeous necklace; the focal is amazing! This piece will look stunning in the autumn season! Beautiful! I always admire seed bead work. The cabochons are awesome, and I love the bead work... Beautiful. Thank you sooo much for the sweetest comment ever. Oh, now I want to see what you do with the rest of the pendants in your soup! The first one works really well! oooh that is gorgeous. The edging around the cabochon is so pretty, you did a wonderful job. Great bezel work... you will have more wonderful projects come from this soup and I for one will be glad to see it... keep beading! Your 'crazy fun embellishment' is probably my favorite part of the necklace you created. However, the whole thing is really beautiful! you did a fabulous job with both cabs, and from looking at your entry into the contest , the blue one will surely be stunning when you are done, and you made a wise choice to not spoil the piece by rushing. Your edging on the other is beautiful- looks like netting, am I right?? Wow, beautiful soup creations. I love how your trim the cabs. Your attention to detail is amazing. Nice bead soup!! You did an awesome job with the cabs! Great job. I am partial to bead embroidery & I admire your work. 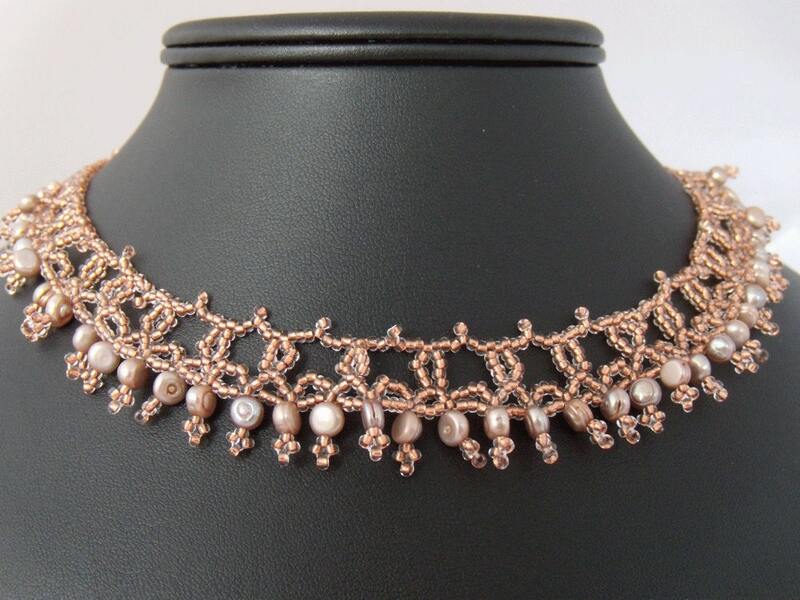 I like very much your beadworking on the necklace, makes the pendant "shining". Those gorgeous pendants were just waiting patiently for your extraordinary skill at beading to lend them a hand. The pieces turned out beautifully - and I adore the graceful 'lace' on the edges! Very pretty! You did a great job with those! 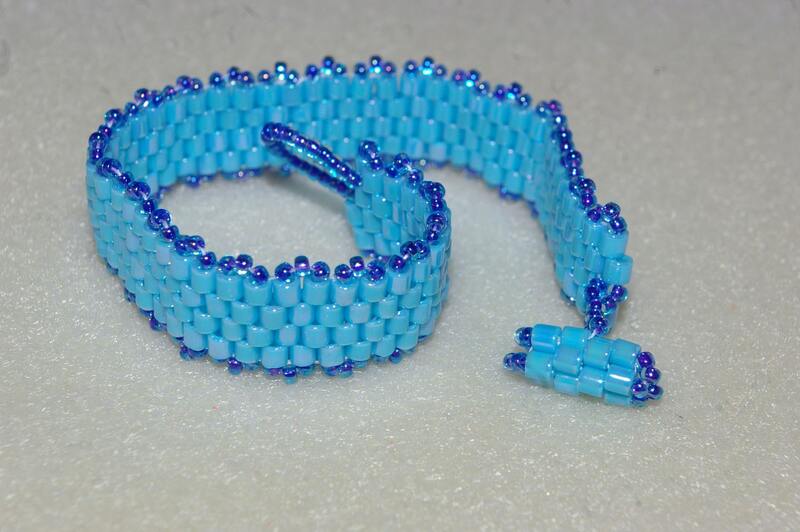 Very pretty - I am still trying to figure out seed-beading, and I love to see what you made.